A familiar face has returned to the SDHL (Svenska damhockeyligan) for the 2018-19 season. One that the league has not seen since the 2016-17 campaign. There are many proponents of women’s hockey who feel that the SDHL – Sweden’s topmost level for the women’s game – is the premier league in the entire world for their sport. There is a lot to lend credence to that notion too. A multitude of star-studded Olympians like Jennifer Wakefield (Canada), Sidney Morin (USA), Lara Stalder (Switzerland) and Jenni Hiirikoski (Finland) all play for SDHL teams. Another international name to throw back into that mix is Czech goaltender Klára Peslarová. Though not yet an Olympian, the 5-foot-7 netminder is widely considered the best female goaltender in the history of Czech Republic hockey. Highly accomplished already, Peslarová is a three-time recipient of the Best Goaltender award in various IIHF World Championship competitions. The most noteworthy instance came during the 2014 Women’s U18 World Championship in Budapest, Hungary when she beat out the likes of Canada’s Shea Tiley, Russia’s Nadezhda Morozova, Sweden’s Sarah Berglind, and the USA’s – and current member of the NWHL’s Boston Pride – Katie Burt. 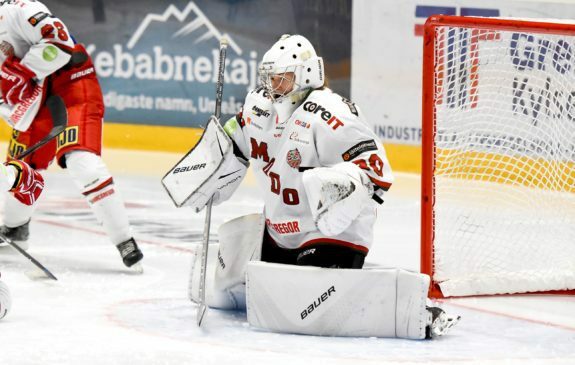 Klára Peslarová protects the net for MODO (Photo Credit: Mats Bekkevold). Now Peslarová has rejoined the SDHL by signing with their MODO hockey club – a team located in Örnsköldsvik, along the coastline of the Gulf of Bothnia. When we last spoke with Peslarová almost a year ago, she was enjoying a hiatus from Swedish hockey and had returned to play in her native Czech Republic. Now she is thrilled to be back playing in the SDHL and looking forward to new opportunities – the main one being a chance to stymie some of the best shooters in the world. This writer has remained in close contact with Peslarová and was able to chat with her regarding why she opted to return to Sweden and what she will bring to MODO. The netminder who will turn 22 years old in November could conceivably play her best hockey yet in the 2018-19 season. We caught up with her while MODO was on a road trip by bus to play against Göteborg. Spending the 2017-18 season in her homeland, Peslarová suited up for both men’s and women’s teams. She played six games for HC Poruba, a team in the Czech 2.liga, the third level of men’s ice hockey in the Czech Republic. It was an interesting team for Peslarová to play for, as some of her teammates included former Portland Winter Hawks (WHL) forward Martin Bucek and former Niagara Ice Dogs (OHL) forward David Sysala. Through her six games with the team she compiled a .868 save-percentage and a 3.00 goals-against average. Peslarová also suited up for one of the top women’s hockey clubs in the Czech Republic, SK Karvina, with many of the women on the team also playing for the Czech Women’s National Team. Her numbers in net for Karvina were an impressive .924 SV% and a 1.70 GAA in nine regular season games. In Peslarová’s lone playoff game with the team she earned a .927 SV% and a 2.77 GAA. Peslarová took an SDHL breather during the 2017-18 to return home to the Czech Republic (Photo Credit: Mats Bekkevold). One might think that playing goaltender for two different hockey teams would be a taxing experience. For Peslarová it was the complete opposite. Being back in the Czech Republic gave her a sense of feeling refreshed and an opportunity to decompress. “It’s a better league, of course. SDHL is one of the best leagues in Europe. Maybe in the world,” she said with a smile. 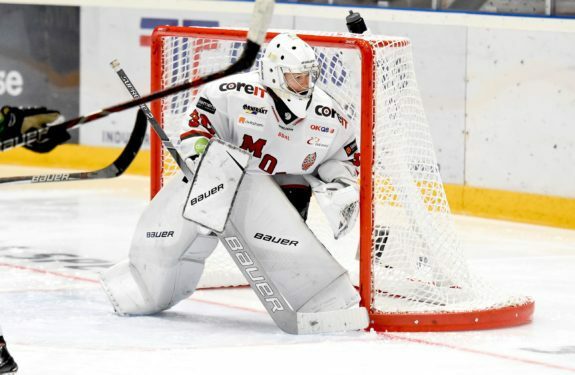 For an elite goaltender who is very much accustomed to a European lifestyle, playing in the SDHL is easily the best way to test her skill and get the level of play that she desires and needs. Lifestyle and familiarity are one thing, but Peslarová is also accustomed to facing the very best on the ice. Keep in mind that in the four IIHF Women’s World Championships that she has played for the Czech Women’s National Team, she has posted save-percentages of .975, .954, .905 and .897 – each of those numbers coming from at least four games. Having given herself an understandable breather, Peslarová now wants to be challenged once more. 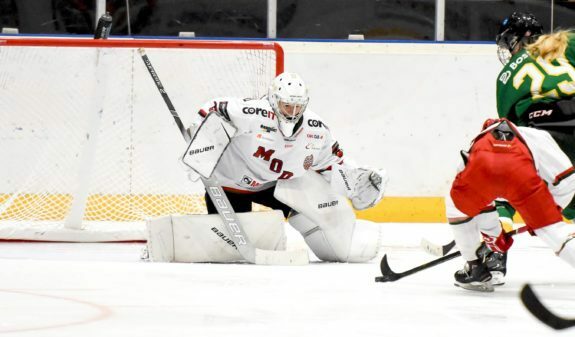 Facing a partial breakaway, Klára Peslarová looks to make the big save for MODO (Photo Credit: Mats Bekkevold). 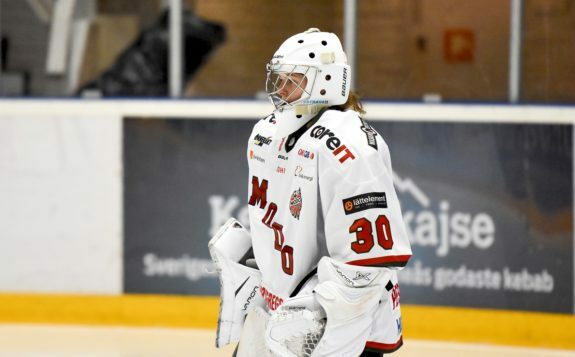 Initially she sought to return to SDE HF (Stocksund Danderyd Enebybergs Hockeyförening) – the SDHL team she had played for during the 2015-16 and 2016-17 seasons. Peslarová played 27 and 21 games during those two seasons respectively. The 2015-16 campaign saw her record a .904 SV% and a 3.59 GAA which were quite decent numbers for a team that compiled a record of 1-30-1-4. SDE’s season would not be much better in 2016-17 – they posted a similar record of 1-30-3-2 – but Peslarová’s would be. Her second SDHL season saw her put numbers together of a .926 SV% and a 2.91 GAA. With such standout performances for a struggling team, one would think that SDE would quickly want to retain Peslarová once she decided to return to Sweden. Instead, it would be MODO to come calling and seek her out. Another important factor in Peslarová’s finding MODO suitable to her needs is that she has familiarity with a number of the organization’s players, and she is getting to know more of her teammates as time goes along. Age wise, MODO is easily the youngest team in the SDHL with the team’s average being under 20 years old. Klára Peslarová is one of four Czechs within MODO’s hockey system (Photo Credit: Mats Bekkevold). This will be an interesting season for Peslarová’s teammate Lerchová too. The 18-year-old winger is fresh off of the 2018 Women’s U18 World Championship in Moscow, Russia where she finished second in scoring for the Czechs. In five tournament games Lerchová had a goal and five assists to be better than a point-per-game player. Anxious eyes are waiting to see how she will perform in her first SDHL season. Having Peslarová as a close friend, a fellow countrywoman, and her goaltender are all reinforcements for a solid first season from Lerchová. What Is Peslarová Most Excited For? SDHL fans are excited to have one of their star goaltenders back into the fold. MODO is particularly on the edge of their seats to have her playing for their squad. Seeing Peslarová perform out on the ice, you are not only witnessing the top goaltender from the Czech Republic but also one of the best goaltenders in the world. There is plenty for hockey fans to be excited over, but what is Peslarová most excited for? Klára Peslarová is very excited to be back playing in the SDHL and with a new team, MODO (Photo Credit: Mats Bekkevold). What message does Peslarová have for fans excited to see her play this season? For a quieter, more reserved person like she is, it was not the easiest question to answer. Rest assured Klára, you indeed have everyone’s full support!